Two Bollenbacher brothers married Huffman sisters. William’s brother Jacob Dewald Bollenbacher married Mary Olga’s sister Maggie Iona Huffman. 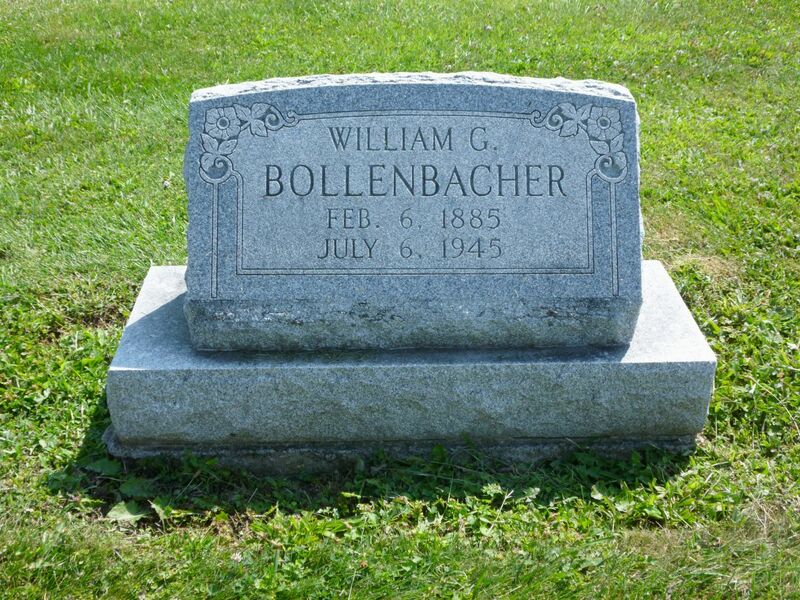 William and Mary (Huffman) Bollenbacher resided in Jefferson Township, Adams County, Indiana, and in 1910 they had two children, Lulu I, 2; and Harold, 6 months. Lulu was reportedly born in Ohio, while Harold was born in Indiana. William farmed. 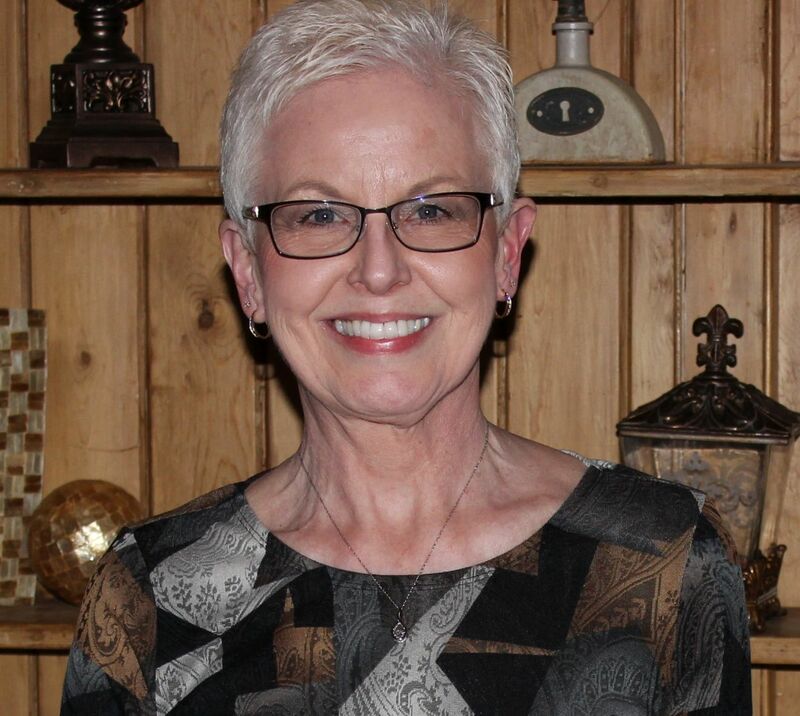 Their son Harold would eventually own and operate Bollenbacher’s Grocery in Chatt. William’s wife Mary Olga died on 16 November 1920. She was only 31 years of age  and left William to raise their four children who were under the age of 13 years. William’s wife Mary Olga is buried in row 7 of Kessler Cemetery, just a few rows away from William. 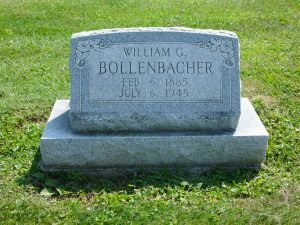 “Ohio, County Births, 1841-2003,” FamilySearch.org, Georg William Bollenbaugher, 6 Feb 1885; Liberty, Mercer Co, Births, FHL microfilm 2367095. U.S. Civil War Soldiers, 1861-1865, National Park Service, Civil War Soldiers and Sailors System; Ancestry.com. 1900 U.S. Census, Liberty, Mercer, Ohio, ED 85, p.6B, dwelling 111, family 116, Jacob Bollenbancher; Ancestry.com; FHL microfilm 1241304, NARA microfilm T623, roll 1304. “Indiana Marriages, 1811-2007,” database with images, FamilySearch.org, William G Bollenbacher & Mary Olga Huffman; Adams County Marriage License Applications, Vol. 2, p.89; FHL microfilm 2321466. Indiana Marriages, 1811-2007,” database with images, FamilyhSearch.org, William G Bollenbacher & Mary Olga Huffman, 6 Feb 1907; Adams County Marriages, Vol. 1, p.179; FHL microfilm 2321629. 1910 U.S. Census, Jefferson, Adams, Indiana, ED 4, p.8B, dwelling & family 165, William G Bollenbacher; Ancestry.com; FHL microfilm 1374351, NARA microfilm T624, roll 338. U.S., WWI Draft Registration Cards, 1917-1918, Adams, Indiana, roll 1439777, William G. Bollenbacher; WWI Selective Service System Draft Registration Cards, 1917-1918, NARA, Washington D.C., M1509. 1920 U.S. Census, Jefferson, Adams, Indiana, ED 4, p.6B, dwelling 125, visited 135, William G. Bollenbacher; Ancestry.com; NARA microfilm T625, roll 420. Indiana Archives and Records Administration, Death Certificates, 1920, roll 19; Mary Olga Bollenbacher, 16 Nov 1920; Ancestry.com; Indiana State Board of Health Death Certificates, 1900-2011, Indiana Archives and Records Administration, Indianapolis, Indiana. 1930 U.S. Census, Jefferson, Adams, Indiana, ED 4, p.6B, dwelling 148, family 149, William Ballembocher; Ancestry.com; FHL microfilm 2340309, NARA microfilm T626, roll 574. 1930 U.S. Census, Jefferson, Adams, Indiana, ED 4, p.4A, dwelling & family 80, Herold Bollenbacher; Ancestry.com; FHL microfilm 2340309, NARA microfilm T626, roll 574. 1940 U.S. Census, Jefferson, Adams, Indiana, ED 1-4, p.5B, line 41, house visited 92, William Bollenbacher; Ancestry.com; NARA microfilm T627, roll 1024. U.S., WWII Draft Registration Cards, 1942, Records of the Selective Service System, 1926-1975, Record Group No. 147, William George Bollenbacher; NARA, Selective Service Registration Cards, WWII, Fourth Registration, Record Group No. 147. Indiana Archives and Records Administration, Death Certificates, 1945, roll 9; William Bollenbancher [as indexed], 6 Jul 1945; Ancestry.com; Indiana State Board of Health Death Certificates, 1900-2011, Indiana Archives and Records Administration, Indianapolis, Indiana.